Today we gather to review the state of our industry, and to hold a mirror up to ourselves – – for the fun of it. The 2017 Quilting in America survey just came out. 7-10 million total estimated quilters in the U.S. The survey found two main groups of quilters: Dedicated Quilters and Under 45 Quilters. Well educated (70% went to college). Spends average $3,363 per year on quilting. 85% prefer traditional style, 37% modern quilting, 20% art quilting. Account for 72.2% of total industry expenditures. 97% of Dedicated Quilters are purchasing fabric in person at a retail location. But 66% also purchase online. 83% of all quilters will purchase 100% cotton thread (hello Aurifil) in the next 12 months. In the last year 26% purchased a new sewing machine. Average price $2212. But what’s happening in the garment industry? 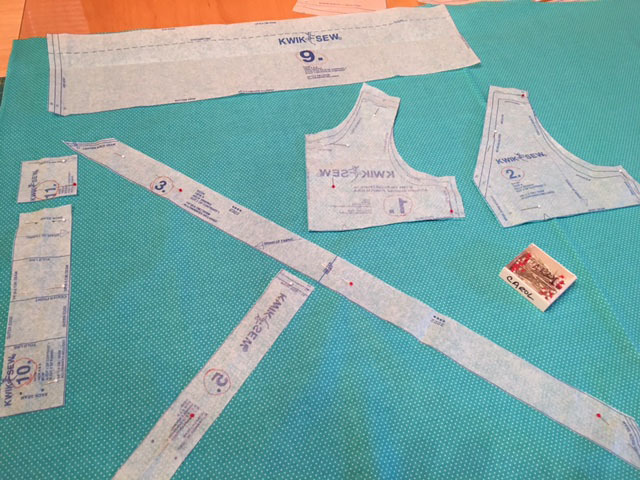 If you are a garment sewist, you have seen some major changes lately as well. Many quilt fabric distributors are now also featuring rayon and denim in their current lines, and often include garment patterns as part of their collections. CSS Industries, Inc. now owns: Simplicity, McCalls, Butterick and Vogue. That’s a LOT of consolidation. Why? Because new indie designers and pattern makers are basically taking over the industry, and leaving the old brand names in the dust. Those “Under 45-ers” listed above want to sew their own clothes. They want it in their own patterns and in their own sizes. Furthermore, distribution channels are basically gone for garment fabrics. JoAnn’s, Walmart, Hobby Lobby? Please. If you’re making a Halloween costume, sure. 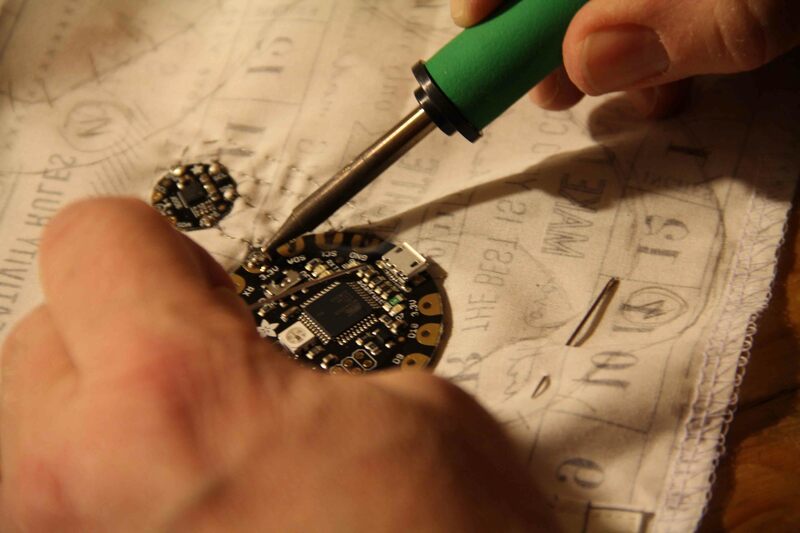 But something you want to wear and spend some time and effort making by hand? Not a chance. 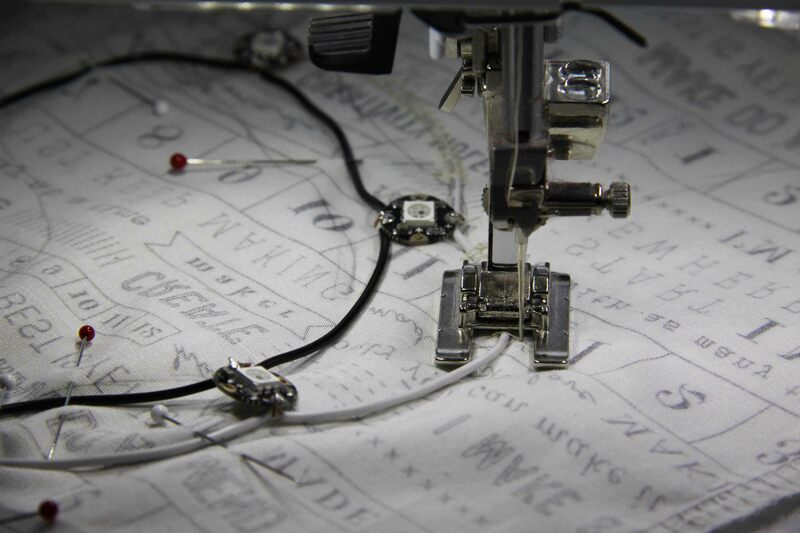 So where does this leave the state of the sewing industry? In a creative and strong place. 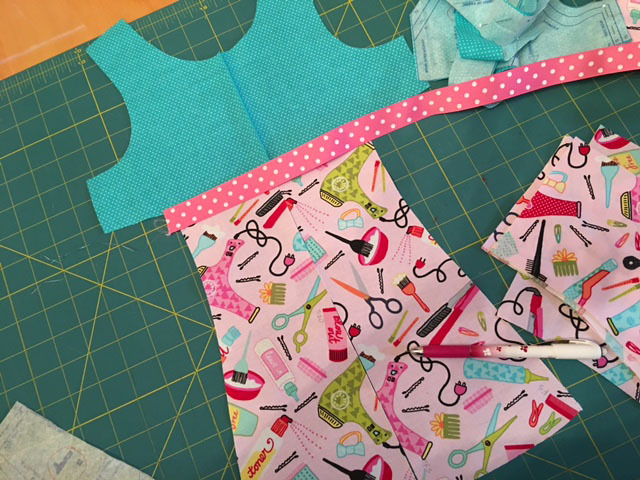 With the Nextgen sewists/quilters already on the rise, and technology and social media filling the gaps in learning curves (not to mention our physical curves like cashmerette.com), the industry is poised for change and growth. We seem to be insatiable in our desire to create and to learn and to connect. Social media makes all this possible in fresh ways. Yet we are still addicted to the feel and touch of fabric, making me believe that we currently have a brick and mortar “hole” to fill. Who will transform the retail and customer experience for us? Who will bring the online and offline advantages together? Consider it a challenge. 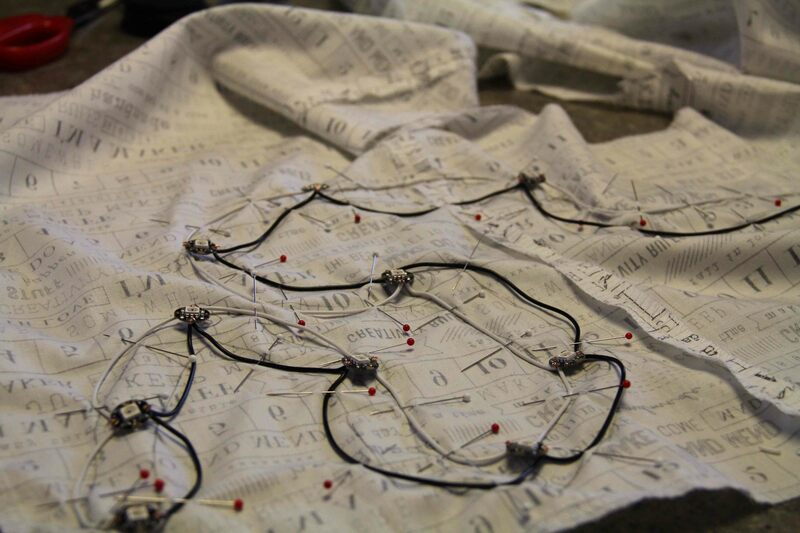 And let the sewing games begin. Happy 2018! 2. If you don’t know what you’re doing, you better follow that pattern EXACTLY. Well, I’m not much of a garment sewer, although from time to time fabric tells me what it wants to become and my job is just to do what it tells me. That’s how it was with this delicious fabric from Cotton and Steel. It’s really not an easy line to piece into a quilt as it doesn’t lend itself to small cuts. But it was just calling out to me, begging to be made into this vest. And so I bought it and set it aside until I was ready. 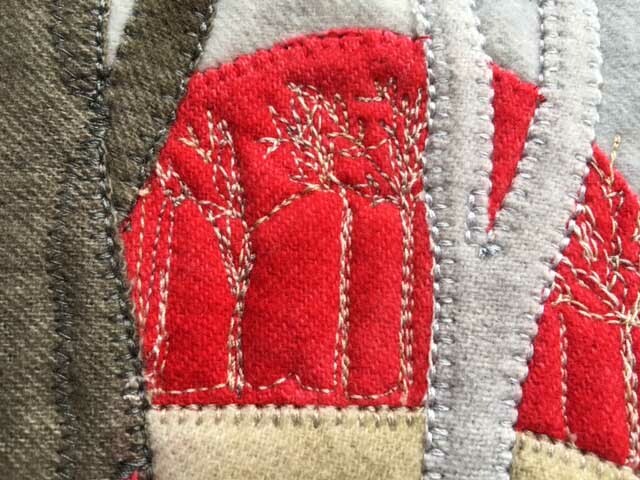 You can see that the line on the pattern indicates that the pattern should lay on the fabric the way it’s shown in the pic above — grain line parallel to the selvage. But that wasn’t the vision. I wanted vertical stripes in front. So I began my research. What will happen if I ignore the grain line? Will the shape be distorted? Will the vest not lay properly? I turned to the Internet where the general consensus seemed to be: Always follow the grain line. Unless you don’t want to. Actually, most people were specific. If you wanted a pattern to run a certain way, then It’s OK to cheat the grain line a bit. Especially on a fabric that is not stretchy. Since I’m working in a pretty tight woven, I thought…I’m going for it. So I cut out all the pieces, along with a liner. 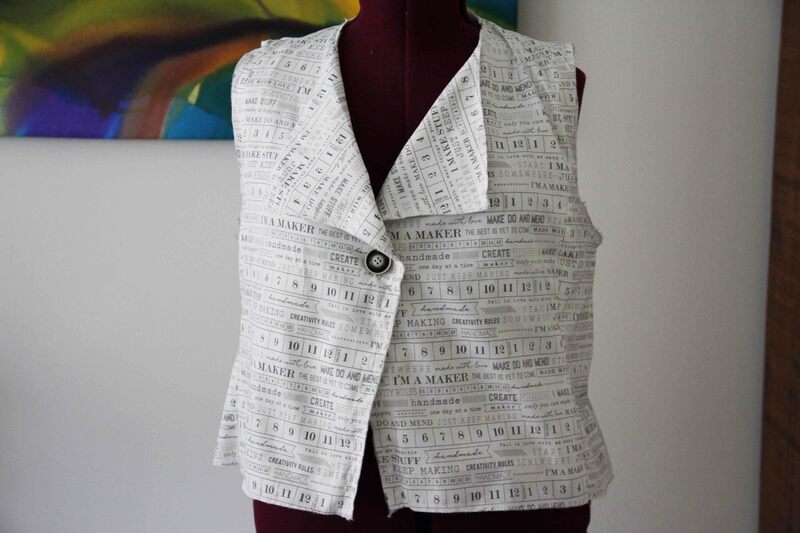 The pattern I was using was from Indygo Junction (Modern Silhouette Vest). As usual, I did not follow the pattern completely. 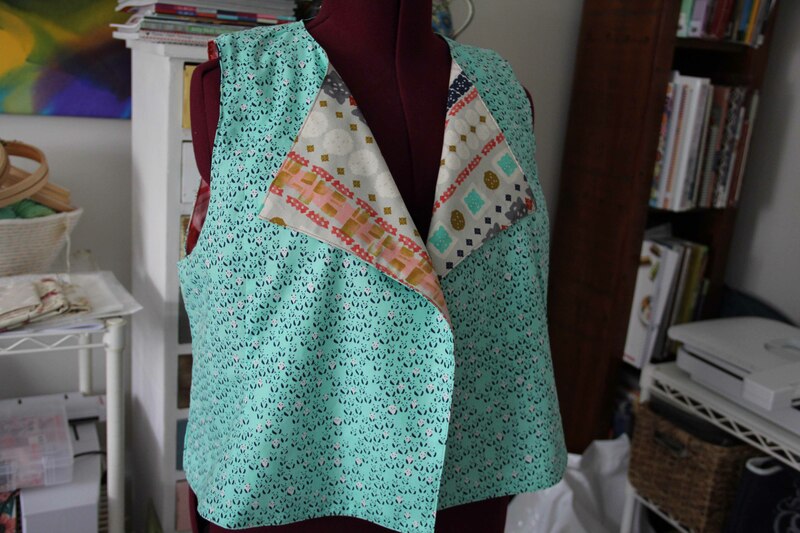 I wanted it to be lined and reversible, so I modified along the way. 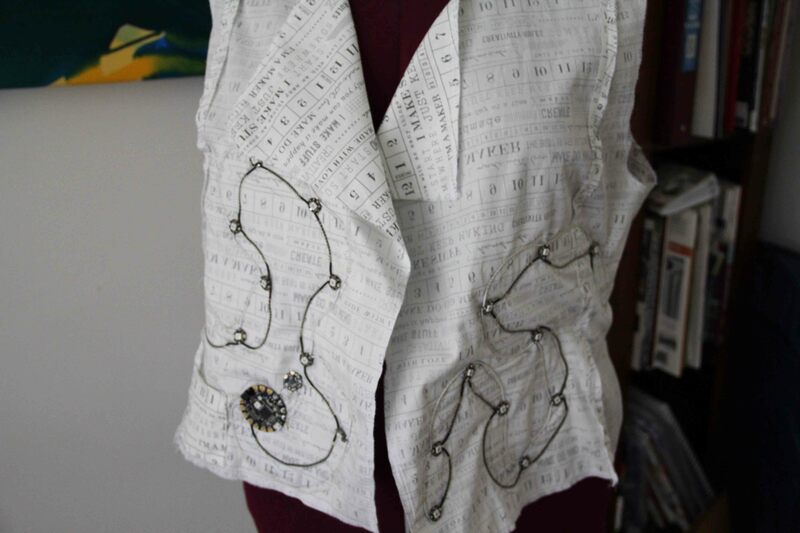 I actually assembled the entire vest, then the entire lining, and pinned them right sides together. Then I stitched around the outside of the whole thing (very much like making a bag lining.) I also went back and serged all the unfinished edges. I left a space in the back hem to turn inside out. ***Do not sew the armholes together when it is inside out. *** Ask me how I know. When I teach, I often tell students “Don’t worry. I make the mistakes, so you don’t have to.” It gets a chuckle, but it’s truth. I make a lot of mistakes because I try a lot of new things. I’m as comfortable unsewing as I am sewing. 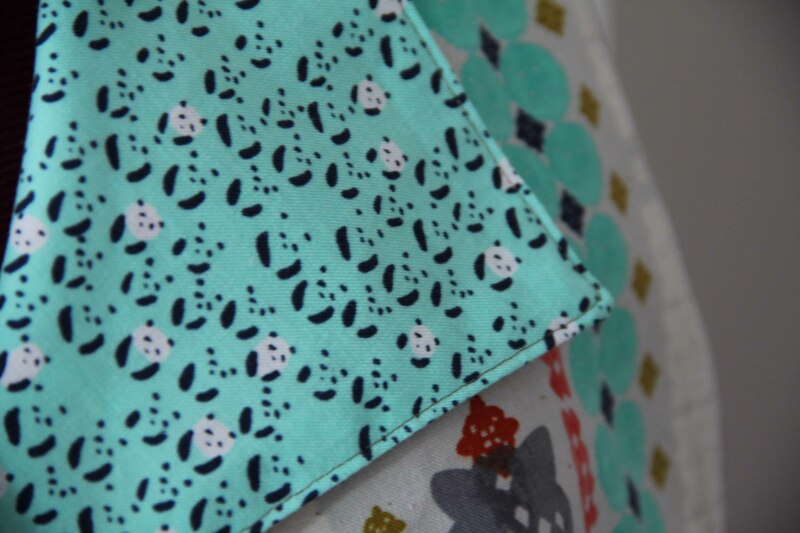 The seam ripper is your friend. As long as the armholes are still raw edge, the whole thing can be turned inside out and pressed. You can finish the armhole by overlocking the right side and lining separately, and then turning them both under and topstitching. It forms a neat finish, with all seams hidden. 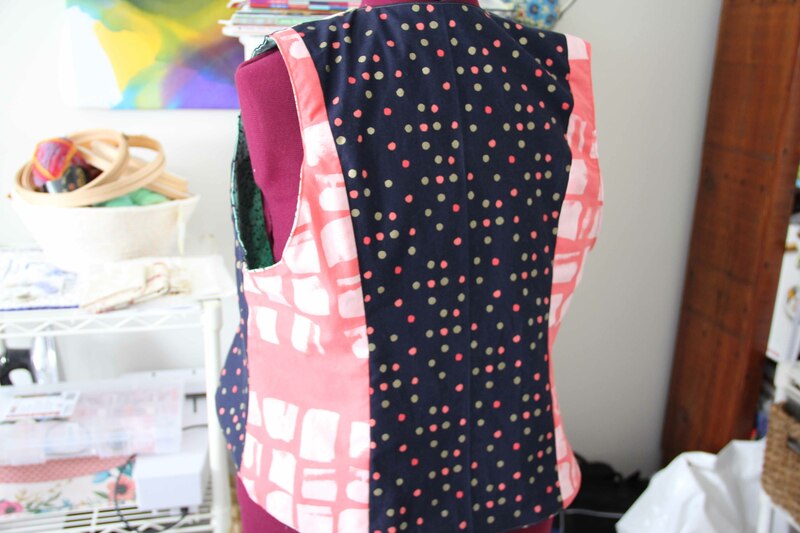 The last step is to topstitch all the way around the vest and in the process turn under the back hem which was left open when you turned it inside out. All seams are finished and I can wear it either way. 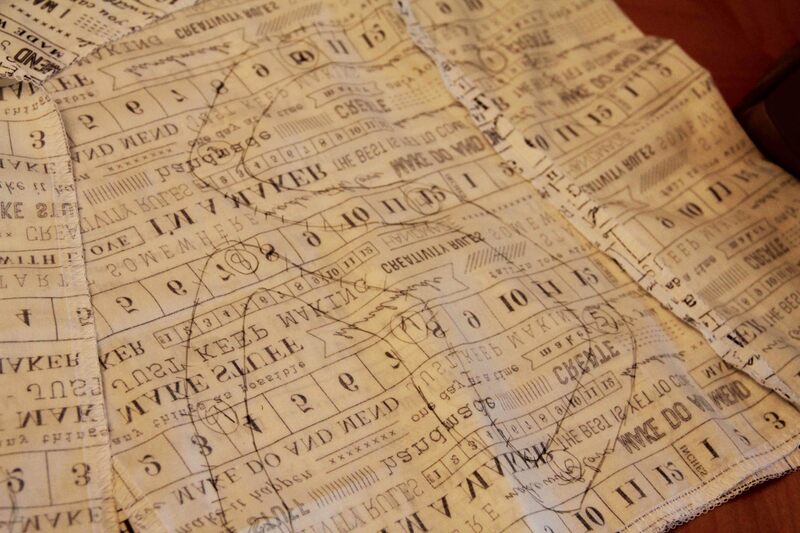 The back is pieced as well with the same line of Cotton and Steel fabric. Final step is to add a button in front. I think I really worried needlessly about the grain line. It lays just fine, and the little pandas were cut on grain. C’mon, that fabric is cute! The bottom line is this: Don’t worry about the grain line QUITE so much when you are working with a medium or tight woven. Anything stretchy, and all bets are off. Go ahead, try something new. And don’t be afraid if it goes against the grain. Oh, it’s irresistable. 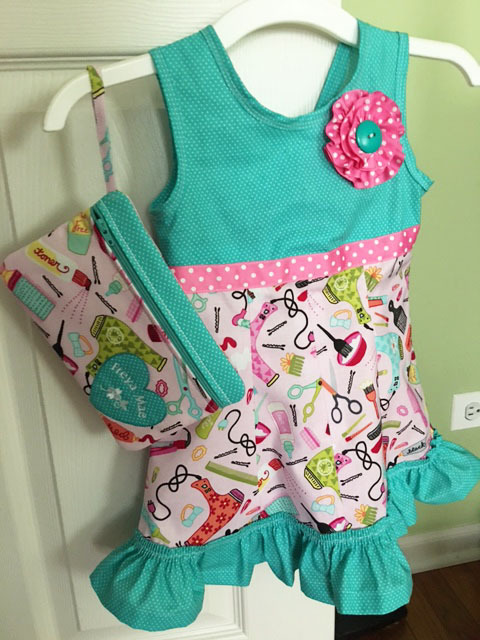 If you have a little girl in your life, and you sew, you will want to make something for her with ruffles…or a little bit of lace, or some gathering, or bows or frills. You won’t be able to resist, I’m not kidding. I have a wee one in my life. But she lives far, and I don’t really know her size. She’s two years old this week, but I decided to make her a 3T dress. 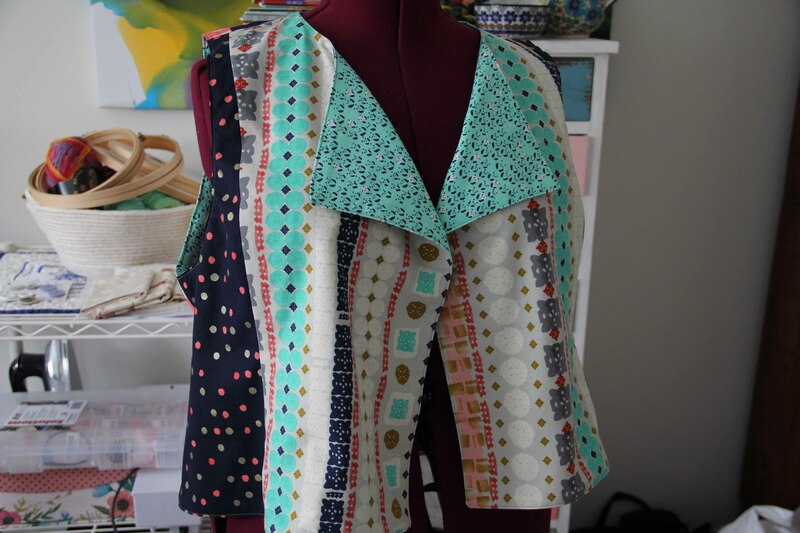 Anyway, garment sewing is not really my thing, but I am more and more interested in it as I would prefer something that fits and is one-of-a-kind, than something store-bought and cheap. I found these great fabrics, and in my head I had it all created before I even found the pattern. You know how that is…then you have to go looking for a pattern that comes close to what you already had in mind. Then the fun begins. And frankly, the older I get the more difficult it is to follow a pattern. 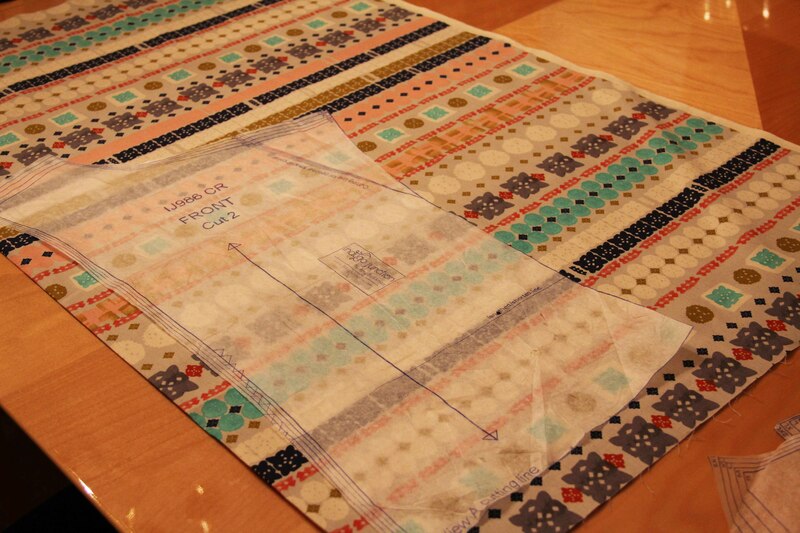 Sew this on the straight of grain, this on the bias, flip this piece backward, and this one sits on the fold. (Not to mention that sometimes patterns have mistakes, so it helps to know a little about what you’re trying to do.) Moreover, I usually just want to do something my way and not the way it shows in the pattern. For instance, on this dress, I replaced the waistband with a ribbon, and I used a ruffler foot to gather the bottom ruffle.The pattern called for the more traditional method of manual gathering. I also changed my color scheme a bit from the original layout. 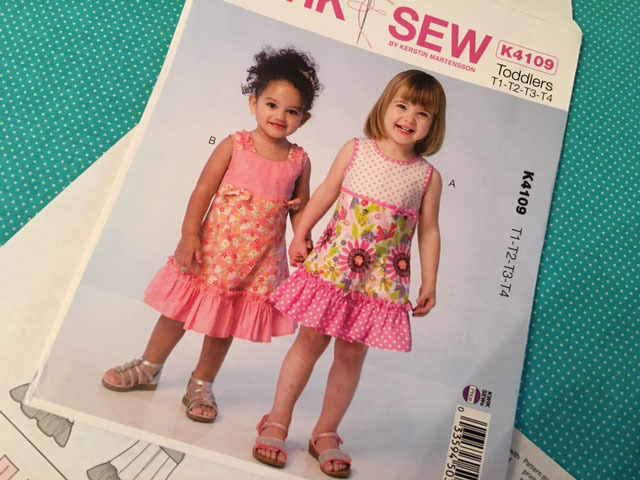 My tip for sewing any garment pattern: Read the pattern from start to finish. (Every pattern will tell you this.) But read it again. And read it again if necessary. Unfold the pattern pieces and stare at them as well. 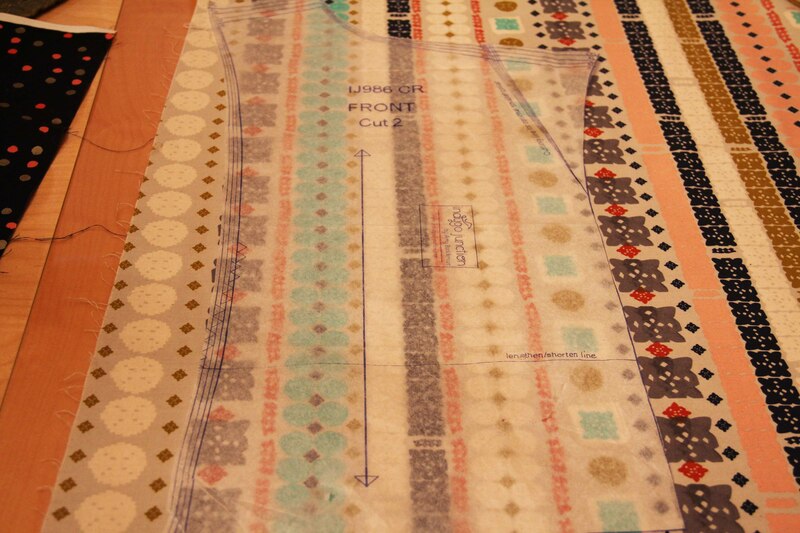 Get comfortable with the whole process in your head before you even lay out your fabric. Trust me on this one. This turned out almost exactly the way I pictured it. I learned a little about the zipper on the back…I would raise it a bit higher. But all in all I am happy with the result. I found out this week that they are coming in to town, so I will be able to give it to this little one in person. I know at two years old, she won’t care. But what can I say? I couldn’t resist. I only hope it will fit her for at least a few weeks so she can wear it. The matching bag is an in-the-hoop project in machine embroidery, and I added her name there. Maybe we can get a few pictures of her wearing it before she eats her birthday cake! If only I could. But every now and then I get sucked into it. 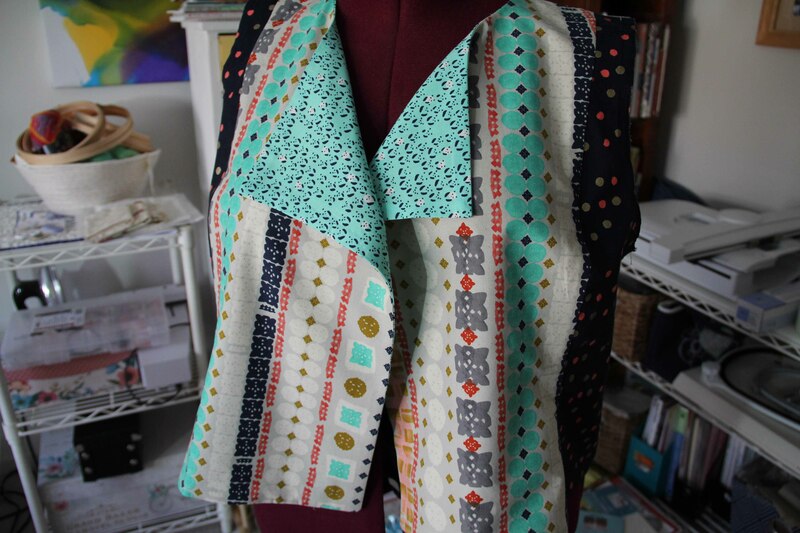 If you sew, you know just how many absolutely gorgeous fabulous creative bright shiny fresh interesting lovely stunning fabric-savvy darling sweet edgy smart…whew…IDEAS are on that site. I am helpless to resist. So this little t-shirt project was inspired by one of the ideas I saw there at some point, and I wish I could credit the original poster. But that’s the thing about pinterest. You click on something, then on another thing, and before you know it you are down the rabbit hole somewhere on a blog, mixing all the ideas together. 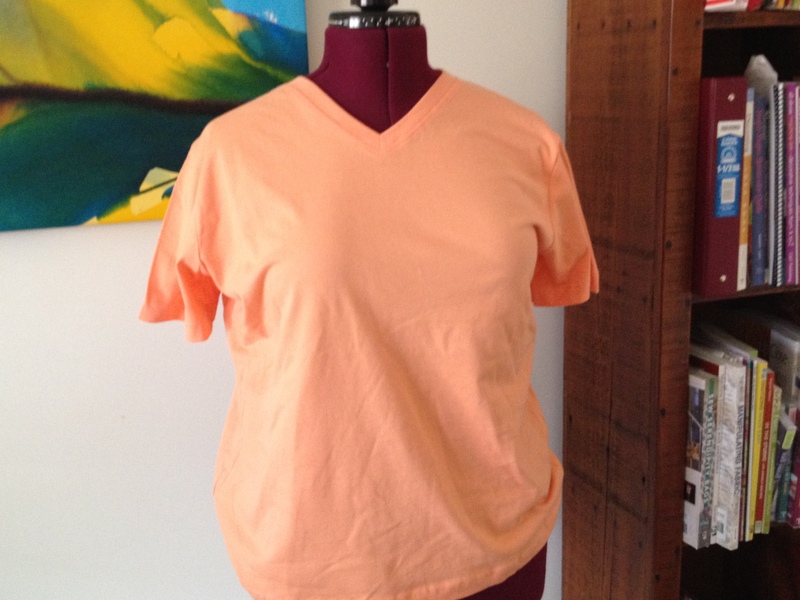 Just a plain tee to start, but it gets cut up into a shrug-type garment. In the summer, I think it will look cute over a tank or tee. Not bad for the $5 or so that I paid for it. In the meantime, I’ll be shielding my eyes from the inevitable lure of pinterest. I was trying to find “Now is the winter of our discontent…” Of course, it had to be Richard Dreyfuss. But I coudn’t find that clip on youtube. So this will have to do. Now I want to watch the whole movie again. Anyway, this is both Chicago in the dead of winter and the winter of our discontent. But it’s great for getting some sewing done. 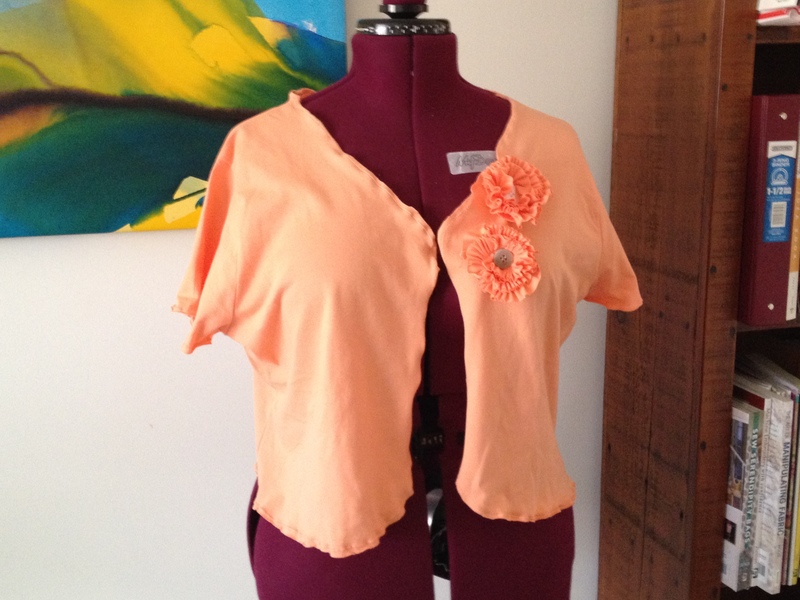 I have been trying to do a little more garment sewing, but it’s not something I’ve done much in the past. It’s just exciting to spend a couple of hours whipping up something to wear when I’m tired of everything in my closet. Also, I have been collecting fabric for garments over the past year or so. They are calling out to me to be utilized. Here’s a very simple sweatshirt jacket that took a couple of hours. 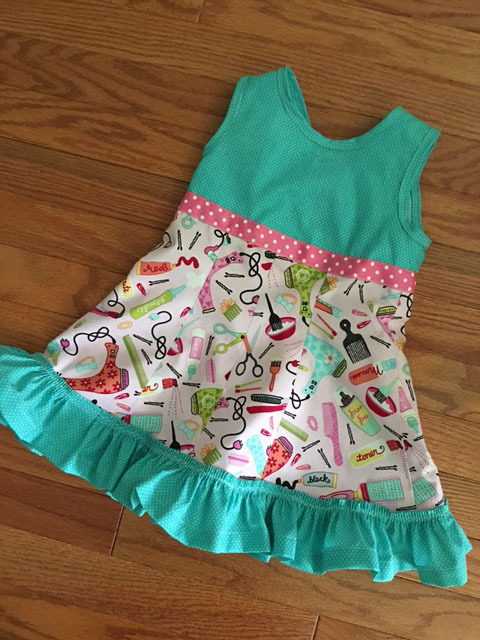 The pattern says 45 minutes, but sorry, it takes me that long to read the pattern and cut the fabric. Then, of course, I modified it a little as I went along, adding some extra topstitching so the seams looked a little more finished. But all in all, I’m pleased with the result. 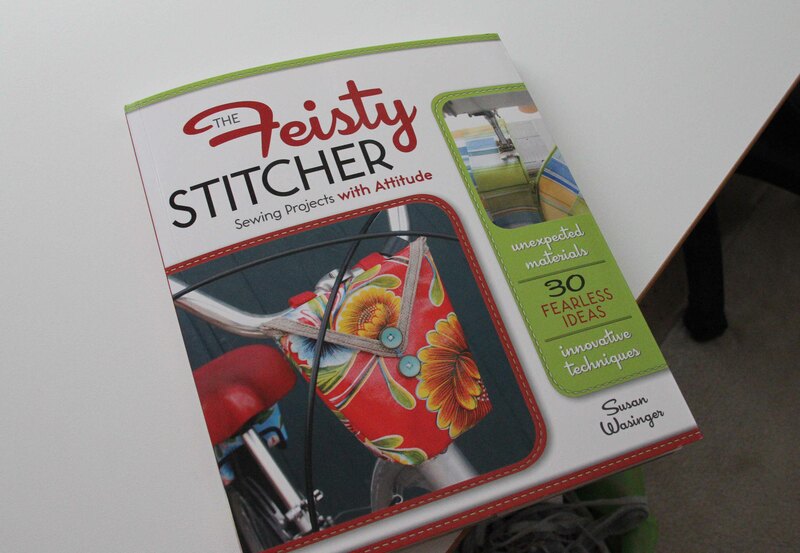 The pattern is from a book called “The Feisty Stitcher” by Susan Wasinger. 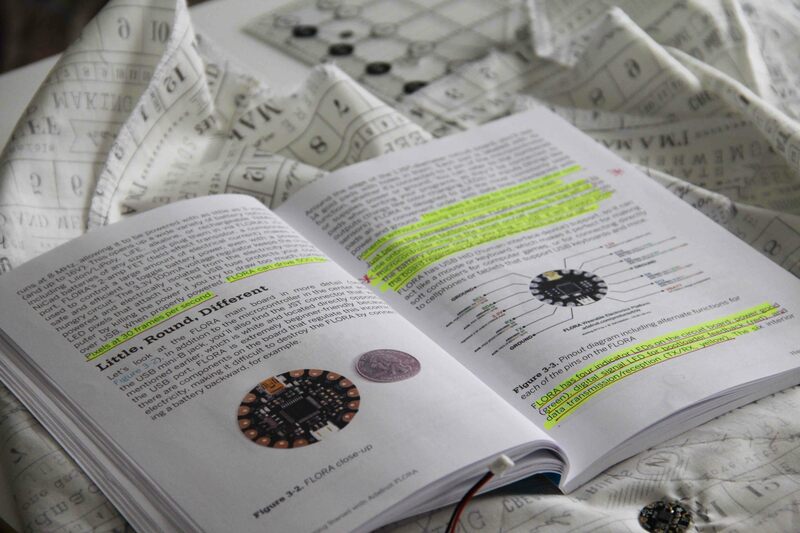 The book has a number of unusual patterns that all look like they would be fun to try. However, this one looked like just my style so I had to try it. As I said, it looked easy enough to do, and quite casual. I did not add the hood, just a simple placket. I thought about adding some embroidery, but that’s for another day. 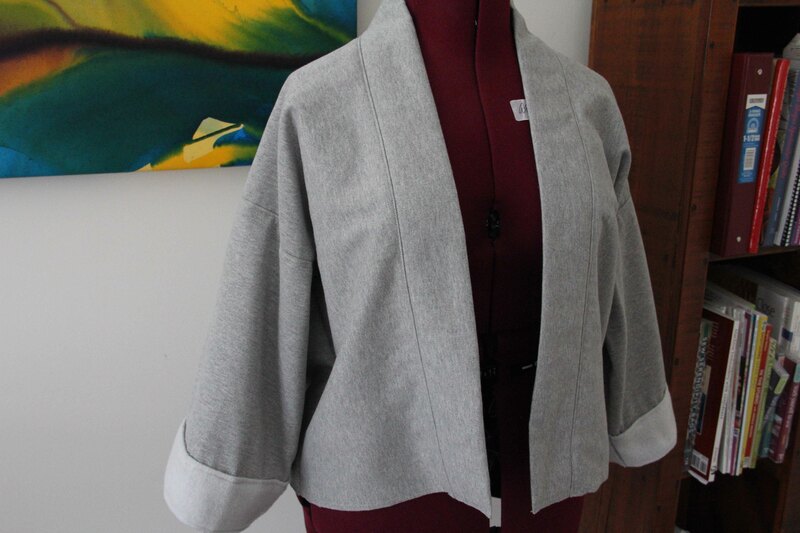 I have some more sweatshirt fabric in a darker color and I just might whip up another jacket some time soon. It’s easy enough that anyone could try it! No garment experience necessary! As for now, I’m off to work on finishing a quilt. The winter of our discontent may just turn out to be one of the most productive we’ve ever had!